Little is a 2019 American fantasy comedy film co-written and directed by Tina Gordon. 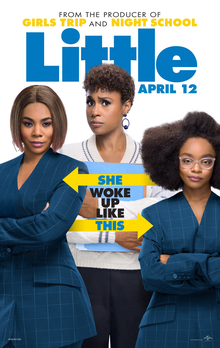 It stars Regina Hall, Issa Rae, and Marsai Martin, and follows an overbearing boss who is transformed into the child version of herself. Martin serves as an executive producer on the project, and at 14 years old is the youngest person to ever hold the title on a Hollywood production. The film was released in the United States on April 12, 2019, by Universal Pictures, and has grossed $21 million worldwide. It received mixed reviews from critics, who praised the performances and heart but called it "a bit safer and lighter on laughs than many would like". Marsai Martin, who stars in the show Black-ish created by Kenya Barris, came to him with the idea for the film on set in 2014 when she was 10 years old, having been inspired by the film Big. Martin acts as an executive producer on Little, and at the age of 14 is the youngest person to ever hold the title on a major Hollywood production. Issa Rae signed onto the film on May 2, 2018, while Regina Hall, who was already attached as an executive producer, joined the cast later that month. Principal photography took place June through August 2018 around Atlanta. The film was released in the United States on April 12, 2019, after originally being slated for a September 20, 2019 release. As of April 17, 2019[update], Little has grossed $19.7 million in the United States and Canada, and $2 million in other territories, for a worldwide total of $21.7 million, against a production budget of $20 million. In the United States and Canada, the film was released alongside Hellboy, After and Missing Link, and was projected to gross $14–18 million from 2,667 theaters in its opening weekend. The film made $5.4 million on its first day, including $735,000 from Thursday night previews. It went on to debut to $15.5 million, finishing second behind holdover Shazam!. On review aggregator Rotten Tomatoes, the film holds an approval rating of 46% based on 122 reviews, with an average rating of 4.93/10. The website's critical consensus reads, "A disappointingly uneven but overall agreeable spin on a familiar formula, Little benefits from a big heart -- and a story that makes good use of its talented, well-matched cast." On Metacritic, the film has a weighted average score of 49 out of 100, based on 36 critics, indicating "mixed or average reviews". Audiences polled by CinemaScore gave the film an average grade of "B+" on an A+ to F scale, while those at PostTrak gave it 4 out of 5 stars and a "definite recommend" of 62%. Peter Debruge of Variety praised Rae and Martin's performances, and called the film an "amusing yet predictable body-swap comedy". The Guardian's Peter Bradshaw gave the film two out of five stars, saying that "[t]he comedy is fundamentally hobbled by the split in narrative focus between Jordan and April. We are never sure who is the heroine here, who has the comedy underdog status, who we are supposed to be rooting for." ^ a b c d "Little (2019)". Box Office Mojo. Retrieved April 18, 2019. ^ Michael Harriot (January 9, 2019). "#BlackGirlMagic: Black-ish Star Marsai Martin Set to Become Youngest Executive Producer in Hollywood History". The Grapevine. Retrieved January 9, 2019. ^ a b Amanda M’Duka (May 2, 2018). "Issa Rae Joins 'Black-ish' Star Marsai Martin In 'Little' From Universal & Will Packer Productions". Deadline Hollywood. Retrieved January 9, 2019. ^ Mary Caldwell, For the AJC. "Now casting: Issa Rae film seeking upscale Buckhead residents". Ajc.com. Retrieved January 24, 2019. ^ "Issa Rae wraps filming of 'Little' in Atlanta". YouTube. Retrieved January 24, 2019. ^ Ryan Reed (January 9, 2019). "Little' Trailer: Watch Regina Hall, Issa Rae in Body-Swap Comedy". Rolling Stone. Retrieved January 9, 2019. ^ a b Anthony D'Alessandro (April 14, 2019). "'Shazam!' Still The Man With $23M+; 'Little' Grows Up; 'Hellboy' Cold With $12M+; 'After' Works Overseas – Midday B.O. Update". Deadline Hollywood. Retrieved April 14, 2019. ^ "Little (2019)". Rotten Tomatoes. Fandango. Retrieved April 18, 2019. ^ "Little reviews". Metacritic. CBS Interactive. Retrieved April 16, 2019. ^ Peter Debruge (April 10, 2019). "Film Review: 'Little'". Variety. Retrieved April 10, 2019. ^ Bradshaw, Peter (April 10, 2019). "Little review – big surprise for a bullying boss". The Guardian. Retrieved April 10, 2019.